We’d love your help. 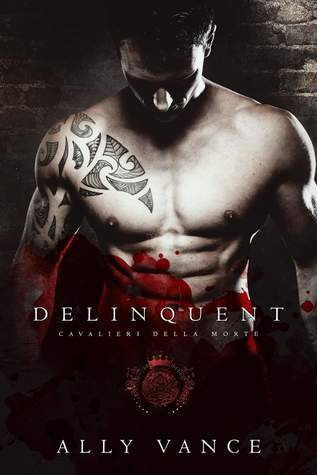 Let us know what’s wrong with this preview of Delinquent by Ally Vance. Thirteen interconnected standalones that will push your limits, test your one handed reading technique, and take you into a suspenseful world where men are domineering and dangerous, and their female counterparts are feisty and strong. To ask other readers questions about Delinquent, please sign up. Ally Vance had my heart racing throughout this story that never once slowed down. It has suspense, action, twists and everything you could want in a book. It’s definitely not a slow burn or for the faint of heart. Be prepared for the darkness Ally Vance always delivers on and some definite violence that may make you want to close your eyes. This book has flawless character development. I absolutely need a Seth and I want to be Leeann when I grow up (yeah ok, my age aside on that one). She’s a fig Ally Vance had my heart racing throughout this story that never once slowed down. It has suspense, action, twists and everything you could want in a book. It’s definitely not a slow burn or for the faint of heart. Be prepared for the darkness Ally Vance always delivers on and some definite violence that may make you want to close your eyes. This book has flawless character development. I absolutely need a Seth and I want to be Leeann when I grow up (yeah ok, my age aside on that one). She’s a fighter who doesn’t hold back and I adored it. I love the push/pull between the two characters and the sizzling chemistry between them. It made for some extremely hot scenes and left me wanting even more of them. The world building blew me away it was so masterful. I not only could see it but I felt like I was right there, even when I wanted to cringe away. The story itself left me breathless. The words just about jumped off the page and I couldn’t stop reading it. Ally Vance pushes the limit and absolutely hits the target on this delectably edgy book. It’s a thrilling must read. 5 stars for a dark, passionate and action filled read! Delinquent is a must one click: Very well written story that will keep you hooked throughout. Seth Galahad - A ruthless killer and highly skilled member of THE CAVALIERI DELLA MORTE but a simple mission turns his world upside down, he gets way more than he bargained for including past secrets & truths. But, he still has to keep focus on his mission: fail and the result, is own death. Leeann Mallory - A spitfire with big enough balls to match the brothers of the Cavalieri Della Morte, betrayed by her own flesh & blood for a gambling debt, she must fight hard and face the ultimate test : Kill or be killed. This book contains dark themes, hot scenes and some twists you will never see coming.